A refrigerant is chemical substance used in the field of refrigeration and air-cooling. It acts as a medium of cooling. Refrigerant Poisoning is the accidental or intentional intake of any product containing the compound. What are the Causes of Refrigerant Poisoning? What are the Signs and Symptoms of Refrigerant Poisoning? The signs and symptoms of Refrigerant Poisoning can vary from one individual to another. It may be mild in some and severe in others. Several systems of the body may be affected. The poisoning may occur due to swallowing the compound or breathing-in of refrigerant fumes and vapors. How is First Aid administered for Refrigerant Poisoning? Who should administer First Aid for Refrigerant Poisoning? 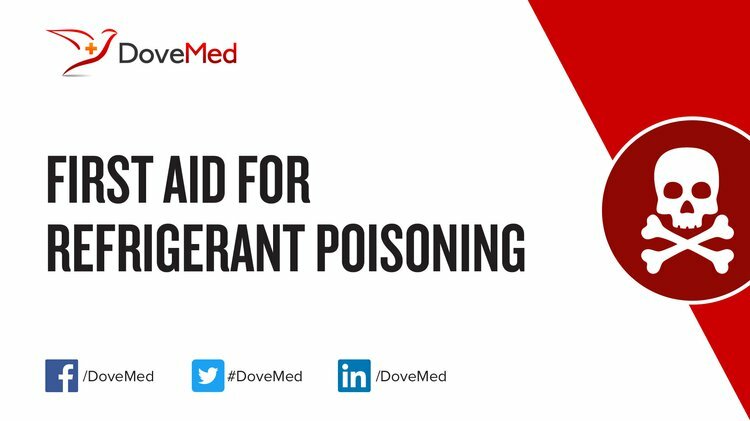 First aid for Refrigerant Poisoning is administered by healthcare professionals. What is the Prognosis of Refrigerant Poisoning? How can Refrigerant Poisoning be Prevented? Ahamed, M. N. B. S. (2013). Compressor Adaptability For A Specific Cooling System. Lecailtel, S., Broucqsault-Dedrie, C., Vanbaelinghem, C., Nyunga, M., Colling, D., & Herbecq, P. (2015). How unclogging a sink can be lethal: case report of an accidental methyl bromide poisoning leading to a multiple organ failure. Journal of intensive care, 3(1), 12. Nguyen, C., Wendling, T., & Brown, S. (2013). Unintentional poisoning deaths in Oklahoma, 2007–2011. Oklahoma City, OK: Injury Prevention Service Oklahoma State Department of Health. Matei, V., Borcea, A., Popescu, G., Matei, D., Bombos, D., Dusescu, C., ... & Atanasiu, M. (2010). Hydrocarbons from Bioethanol Conversion as Ecological Refrigerant. Petroleum-Gas University of Ploiesti Bulletin, Technical Series, 62. Rani, M., & Murty, O. P. (2012). Standard operative procedures and auditing for poisoning cases in India. Journal of Forensic Medicine and Toxicology, 29(1), 80-92. Marmela, H., & Nikkinen, T. (2017). Ensiapu kylmäainealtistuksessa. Kan, R. W., & Ho, T. P. (2014). FIND ISSUES. Hong Kong Med J, 20(6), 548-51. Wangchuk, P., Pyne, S. G., & Keller, P. A. (2011). Ethnobotanical authentication and identification of Khrog-sman (lower elevation medicinal plants) of Bhutan. Journal of ethnopharmacology, 134(3), 813-823. McKeown, N. J., & Burton, B. T. (2012). Acute lung injury following refrigeration coil deicing. Clinical toxicology, 50(3), 218-220.